There is something holy about old dogs. I can’t quote scripture to prove it, but I can see the sacredness in the eyes of my old dog, Emmie. And I know God sees it in her too, that He placed it there. I’m finding that God often places the holy and pure things where we least expect them. I know that He uses my dog to make me a better person, to teach me things. Emmie has been a good and faithful friend to me for more than fourteen years. A Golden Retriever (with a bit of Chow-Chow) she never knew the first thing about retrieving. But being kind and loving, joyful and true? She knows everything about that. My sweet Emmie may not know about retrieving. But she knows all about love, unconditionally. In times of sorrow, I have buried my face in her uber-floofy coat and cried buckets of tears, and she didn’t seem to mind. She lay perfectly still, only moving to lick my face. Always compassionate. In times of great joy, she has skipped circles around me, pouncing up and down as if she had a single clue as to what the celebration was all about. Joyous oblivion. Where have I felt this feeling before? And then I remembered: standing in Saint Patrick’s Cathedral in New York City. I, as a tourist from North Carolina, standing in the sanctuary of the church, having never seen so regal a place, in the presence of magnificence….. awed and humbled. How odd that the countenance of a loving, loyal animal would remind me of such a holy place. The same sensation of being close to what His hand had fashioned flooded me in this realization: Where God’s glory is manifest in the great majesty of architecture and art, it is also manifest in the eyes of an old dog. Holy and sacred – right where God placed it. Thank you, Lisa. Love you. HaHA! I’m glad you like it! Seems we have similar taste in doggies and templates 🙂 Thank you so much for reading – enjoyed perusing your blog as well, although I must tell you….it made me want to go out an adopt about six new puppies. Aren’t they the best dogs EVER? This is the sweetest post ever! Is it a coincidence that dog is God spelled backwards? Hmmm. Thank you, Karen. Emmie holds such a special place in my heart. She is just love incarnate! Gahhhhhh!!!! (Tears!!!) Sox and Emmy have been in lives for all these good years. True beauty is seen clearly in our pets’ eyes. LOVE THIS! Great Post! It didn’t make me cry… snif! snif!… much! Thanks again for opening up your heart and opening up my mind! Thank you, Mel. We sure do love our animals. Isn’t it so true? Pure love….unconditionally. Thank you for reading it! this is so sweet and true! we’ve been blessed to have shared our lives with two Golden girls, Samantha and Andi. ❤ i can't wait to send this to my hubby…i know his heart will just melt! Thanks, Tif. My Emmie is napping right next to my desk. Wherever I go, she goes – especially since I had the surgery to repair my broken leg (over the past three months). I gotta tell you, being unemployed has paid in non-monetary ways galore! Like time writing, time with my kids, time with my Emmie. God is so good! What a wonderful tribute!! I especially liked your correlation of their focused eyes. YES, may we always fix our eyes on Jesus!! Dogs keep focus so much better than we do, unless there’s a squirrel! Amazing. As always..you put all my thoughts into words. What a beautiful, beautiful tribute to sweet Emmie..and all others like her out there. You are a blessing to us all, Jana. 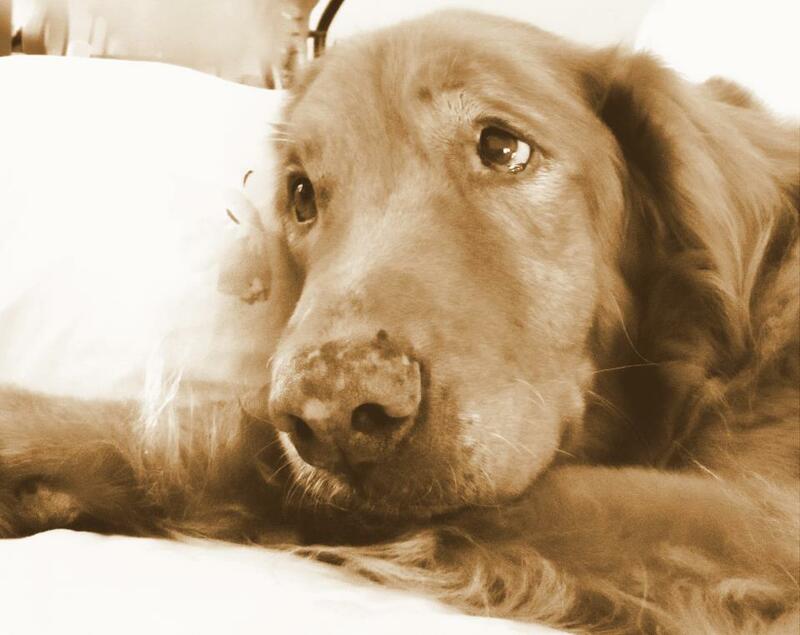 Jana, such a beautiful post about a beautiful doggie. I remember many years ago when I had to take our 15 year old shihtzu gizmo to the vets for the last time. Tore my heart out for a long time. Still can’t drive by the vet in MD without tearing uo remembering that day. Thanks for helping me relive those moments and remembering the beautiful brown eyes. You have a gift. Will be praying for you and for emmie. Aww, Karen. I’m so sorry about Gizmo. Love to you, sweet friend. Thank you for your prayers. I so appreciate that you took the time to read this piece. God bless you and yours. Yes, that blasted squirrel! Love to you, Pearl. Very beautiful and so true. I’m reminded of how my golden boy, Jesse used to climb the fence. Thank you. Reblogged this on Anything is Possible! . Dogs are just the sweetest. I’ve touched the face of God whenever I pressed my forehead against Lucy’s, my fourth Golden. I’ve watched his skip and dance just because I came home. I’ve known how he longs for my company when Bear, my first, laid her head in my lap and waited for my touch. Perhaps only those who’ve had a Golden as one who sticks closer than a brother can fully appreciate your insight. I hope not. I wish everyone could. They are just the very best, aren’t they, Jeff? Love them so much. I miss my Emmie so. We shall see them again, whole and healthy. God bless you! Emmie crossed over the Rainbow Bridge a few years ago, but I still miss her presence like crazy. Reposting this in honor of her. See you on the other side, old girl.